Vanished Valley Brewing Co. owners Mike Rodrigues and Josh Britton. In a tiny space behind Europa Black Rock Bar & Grill in Ludlow, big things are happening. Into what looks like a small storage shed that once served as the chef’s quarters when the restaurant was an inn, Josh Britton and Mike Rodrigues have crammed an entire brewery. “We tore it down and built it back up from the ground up and then crammed a bunch of stuff into it,” Britton said with a smile. But don’t let the operation’s diminutive nature fool you. The two have grandiose plans. “If we can produce what I think we can produce out of here in a given year, we’ll go well above and beyond what the industry standard is for this kind of square footage. I’d like to get to 700 barrels in a year. That’s still small, but given our size and our capacity, that’s a lot of beer,” Britton said. A year and a half ago, Britton, who had been home brewing under the name Footbridge Brewing, and Rodrigues, the owner of Europa, were introduced through a mutual friend, hit it off and Vanished Valley Brewing was born. 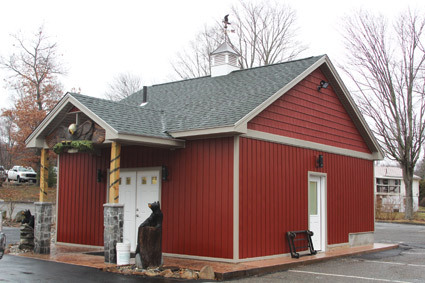 From there they formulated a plan and set it in motion, applying for licensing in February 2016 as they began building a brewery out of the old shed-like structure. In addition to building a space, the two were also building their beer and perfecting recipes. Rodrigues said the company now plans on a full launch of its products in April. In the meantime, they have put some of their beer on tap at Europa to a strong response. The first beer to be introduced at the restaurant was Pomona, an IPA “jam-packed with Citra” hops, according to Britton. “It’s our take on the New England IPA, which everyone loves nowadays, including us,” he said. Vanished Valley will also feature another New England-style IPA called Watershed, which includes generous amounts of Mosaic and Simcoe hops. A pale ale called Take Flight is appropriately named as it features a sizeable helping of Falconer’s Flight hops with some Simcoe. For the newcomer to craft beer, Britton suggests the Gon’ Fishin’ Kolsch. On the darker side, Vanished Valley will offer Lost Town, a chocolate milk stout flavored with cocoa nibs and Madagascar vanilla beans. Other beers will be developed as time goes on, he added. “We’re certainly going to branch off into other styles and our creative juices are always flowing,” he said. If you think you’ve noticed a theme in the names of the products, you’d be right. Most of the names, including the company’s brand, are a hat tip to the Quabbin Reservoir. Vanished Valley will be available in the next few weeks on draft various locations in the Springfield, Amherst and Northampton area as well as Europa, Rodrigues said. Once the official launch takes place, the company will offer growler fills on site. Britton also said they would eventually like to branch into canning. 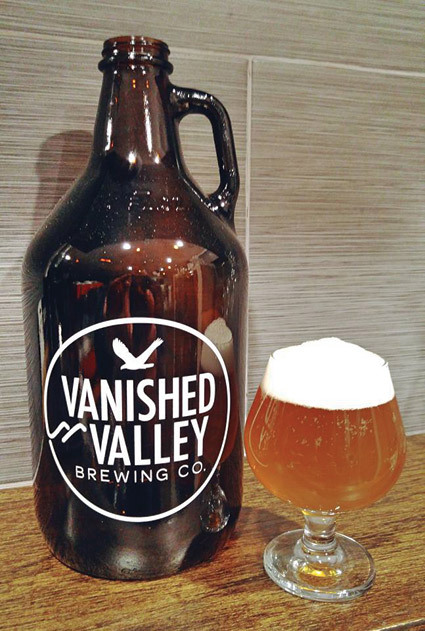 For more info on Vanished Valley, visit www.vanishedvalley.com or www.facebook.com/VanishedValleyBrewing.